Located off the coast of KK in Sabah, Sapi Island is a must visit destination when you are around in KK. 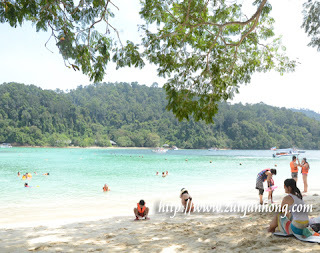 The cool breeze, white sand beach and crystal clear water of Sapi Island are really charming. As shown in the photo, the scenery of Sapi Island is truly fascinating. 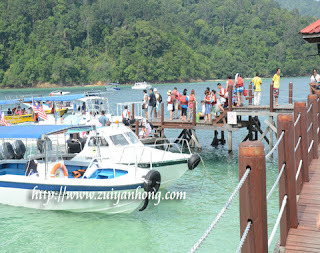 Sapi Island is one of the islands of Tunku Abdul Rahman Marine Park. Visitors can get there by speed boat from Jesselton Point. Suppose you like snorkeling, the required equipment is available at Jesselton Point and Sapi Island. For avoiding the trouble of carrying around, it's better to get the stuff at Sapi Island. Regarding food, if you wish to savor lunch at Sapi Island, you have to inquire at the ticket counter of Jesselton Point. Otherwise you can buy some food and bring along to Sapi Island.